The best indoor theme park in the area, just got even better! Tom Foolerys Adventure Park is over 100,000 square feet of family fun and excitement! In one day you can go from a challenging ropes course, to laser tag, to scaling a three-story climbing wall, and everything in between! Take a ride on the six-story Ferris wheel, located in a spectacular glass enclosure. Challenge yourself to our ropes course* and climbing walls or blast your way through a game of 3D Laser Tag! 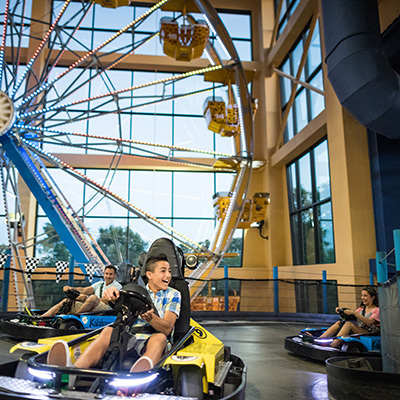 Experience the thrills of our two-story go carts, 18 holes of mini golf (featuring two water holes and a 35′ waterfall), 24 lanes of bowling and much, much more! Ferris Wheel, Laser Tag, Meteorace go carts, Toucan Climb ropes course, Lil’ Toucan Climb, Legend of the Lost Jungle mini golf, G-Force One, XD Dark Ride, Atomic Rush, Centrifooled, Kalahari Carousel, Conqueror’s of Mt Foolmore climbing wall, Sky Rangers coaster and RevoFOOLtion. Passes not valid for arcade games, bowling, lazer frenzy, virtual sports, golf or nascar simulators. Passes have no value toward video/redemption games or food and beverage. Games and Rides: 10:00 a.m. – 11:00 p.m.
Games: 9:00 a.m. – 12:00 a.m. Rides: 10:00 a.m. – 12:00 a.m.
Games: 9:00 a.m. – 11:00 p.m. Rides: 10:00 a.m. – 11:00 p.m.
*Height and age restrictions vary by ride. Please Click Here for detailed information.